Hang onto your hats all you Pixar fans. Pixar Pier is opening in June 2018 at Disney California Adventure in Disneyland Resort. New Pixar-themed attractions will replace many of the longtime attractions, however there will still be several things that will remain, notably Mickey Mouse on the Ferris wheel. 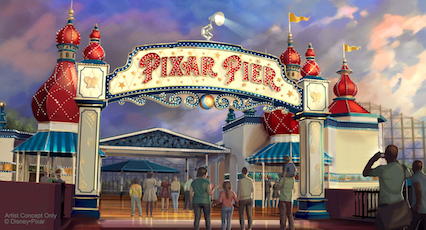 Pixar Pier will be divided into four neighborhoods: The Incredibles, Inside Out, Toy Story, and a fourth that will include plenty of characters from the other Disney-Pixar films. With character/movie-inspired rides, merchandise, and food, guests to this area of the park will be immersed in all things Pixar. 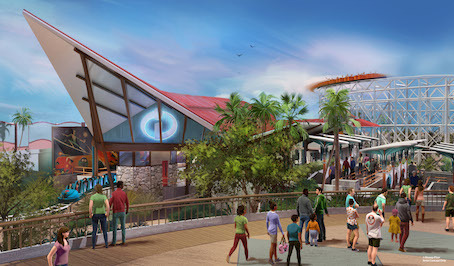 The Incredicoaster, formally California Screamin’, will feature sights and sounds from The Incredibles. It still promises to be as electrifying as California Screamin’ but with the Pixar flavor. The Inside Out neighborhood will include the characters from that film and a new attraction. The Toy Story neighborhood will keep Toy Story Mania! and build on that in this district for all the Buzz and Woody fans. The Midway games will also be transformed to include the characters from the Pixar films. 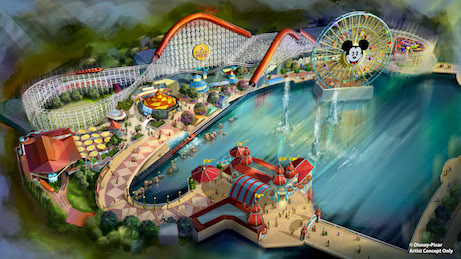 The remainder of the pier area will be renamed Paradise Park, which will keep the current attractions: Silly Symphony Swings, Jumpin’ Jellyfist, Goofy’s Sky School, Golden Zephyr, and Ariel’s Undersea Adventure. “Paint the Night” parade returns with some new elements. Elastigirl, Violet, Dash, and Jack-Jack will be there to entertain guests in this parade featuring pop-art effects and LED lights. For everything there is a season and a time, so it’s now time to say goodbye to Paradise Pier and hello to Pixar Pier. Mark your calendar for June 23, 2018 when Pixar Pier opens at Disneyland Resort in Anaheim. Francine Brokaw has been covering travel and entertainment for over 20 years. She also writes about products and travel. She has been published in national and international newspapers and magazines as well as Internet websites. She has written her own book, Beyond the Red Carpet The World of Entertainment Journalists, from Sourced Media Books.